A heart positron emission tomography (PET) scan is an imaging test that uses a radioactive substance called a tracer to look for disease or poor blood flow in the heart. Unlike magnetic resonance imaging (MRI) and computed tomography (CT), which reveal the structure of and blood flow to and from organs, a PET scan gives more information about how organs and tissues are working. A heart PET scan can detect whether areas of your heart muscle are receiving enough blood, if there is heart damage or scar tissue in the heart, or if there is a buildup of abnormal substances in the heart muscle. A PET scan requires a small amount of radioactive material (tracer). This tracer is given through a vein (IV), most often on the inside of your elbow. It travels through your blood and collects in organs and tissues, including your heart. The tracer helps the radiologist see certain areas or diseases more clearly. You will need to wait nearby as the tracer is absorbed by your body. This takes about 1 hour in most cases. Then, you will lie on a narrow table, which slides into a large tunnel-shaped scanner. Electrodes for an electrocardiogram (ECG) will be placed on your chest. The PET scanner detects signals from the tracer. A computer changes the results into 3-D pictures. The images are displayed on a monitor for the radiologist to read. You must lie still during the PET scan so that the machine can produce clear images of your heart. Sometimes, the test is done in conjunction with stress testing (exercise or pharmacologic stress). The test takes about 90 minutes. You may be asked not to eat anything for 4 to 6 hours before the scan. You will be able to drink water. Sometimes you may be given a special diet before the test. You take insulin for diabetes. You will need special preparation. Always tell your provider about the medicines you are taking, including those bought without a prescription. Sometimes, medicines may interfere with the test results. You may feel a sharp sting when the needle containing the tracer is placed into your vein. A heart PET scan can reveal the size, shape, position, and some function of the heart. It is most often used when other tests, such as echocardiogram (ECG) and cardiac stress tests do not provide enough information. This test can be used to diagnose heart problems and show areas in which there is poor blood flow to the heart. Several PET scans may be taken over time to determine how well you are responding to treatment for heart disease. If your test involved exercise, a normal test will usually mean that you were able to exercise for as long or longer than most people of your age and gender. You also did not have symptoms or changes in blood pressure or your ECG that caused concern. There are no problems detected in the size, shape, or function of the heart. There are no areas in which the radiotracer has abnormally collected. The amount of radiation used in a PET scan is low. It is about the same amount of radiation as in most CT scans. Also, the radiation does not last for very long in your body. Women who are pregnant or are breastfeeding should let their provider know before having this test. Infants and babies developing in the womb are more sensitive to the effects of radiation because their organs are still growing. It is possible, although very unlikely, to have an allergic reaction to the radioactive substance. Some people have pain, redness, or swelling at the injection site. Most PET scans are now performed along with a CT scan. This combination scan is called a PET/CT. Dorbala S, Koh AS. Radionuclide imaging (cardiac). In: Abbara S, Kalva SP, eds. 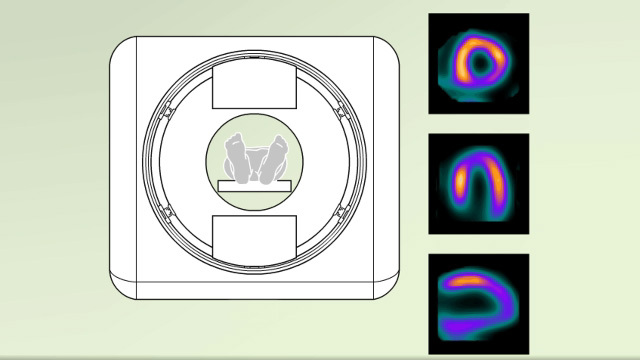 Problem Solving in Cardiovascular Imaging. Philadelphia, PA: Elsevier Saunders; 2013:chap 5. Udelson JE, Dilsizian V, Bonow RO. Nuclear cardiology. In: Mann DL, Zipes DP, Libby P, Bonow RO, Braunwald E, eds. Braunwald’s Heart Disease: A Textbook of Cardiovascular Medicine. 10th ed. Philadelphia, PA: Elsevier Saunders; 2015:chap 16.